After spending two weeks abroad in Rwanda, Webster University students learned there is more to the country than the genocide of 1994. This is the third time Webster has offered this eight-week human rights hybrid course where students learn about Rwanda before spending two weeks learning from the Rwandans themselves. They spent a majority of the time in the capital, Kigali, where they experienced traditional Rwandan culture. Senior international human rights major, Gabby Ventucci, said people in the United States are usually more aggressive toward faith than in Rwanda; they do not push faith onto you. “A lot of their religion has always been in their culture but the way that they got through the genocide was very strongly through faith,” Ventucci said. Azizi Life is a time of cultural experiences where the students participated in numerous activities, such as carrying grass on their head. The genocide of 1994 happened over the span of 100 days when more than 800,000 people were slaughtered in Rwanda by ethnic Hutu extremists. When asked what she learned from the trip, junior Maureen Kesterson-Yates looked past the war and hardship and shined light on the good. “Rwanda is like a phoenix … where a lot of people are looking at the death, the flame, the dying of the phoenix — which would be the genocide — they should be looking into the ashes of the baby bird coming back up to be strong again,” Kesterson-Yates said. The students were accompanied by human rights professor Dr. Elizabeth Sausele and international human rights professor Dr. Lindsey Kingston. Sausele has been to Rwanda six times as part of her research. She went for three weeks each time to learn about the culture, build relationships and learn how to negotiate her way around the country. “As a professor of human rights, how this course came about was really my desire to give students an opportunity where they go past book learning and actually engage,” Sausele said. One of the first places the class visited was the Kigali Genocide Memorial, which was built to commemorate those whose lives were lost in the 1994 genocide. “One of the first things that happened when we walked in was [hearing] wailing, and it was one of the girls in the group Children of Survivors, and she was having to be held up by two of her friends from both sides because she was falling to the floor, not even crying but wailing,” Ventucci said. At one point, while everyone was watching the video in the memorial, Ventucci took a seat on a beanbag on the floor when she noticed a girl from another group looking for a seat. She then got up so the other girl could sit down, but noticed the girl only sat on the edge. Ventucci decided to sit back down next to her, sharing the beanbag. Throughout the film they got more comfortable with their personal space and watched the remainder of the film sitting back-to-back. “It was the point of feeling like we’re accepted and they understand that we are there to not impose or to not look at them like we’re trying to fix them. It was really amazing,” Ventucci said. The group took a half-hour boat ride to the island of Nkombo, between Rwanda and the Democratic Republic of the Congo. Senior cultural anthropology major Ellie Duff recalled having to shovel water out of the boat because it started to rain and they thought they were going to sink. Once they got to the island, the group then had to hike up a muddy hill. Through a connection Sausele had, they were able to visit a preschool on the island. Students walked with the children about four city blocks on dirt roads to a twice-weekly supplementary feeding program called the Porridge Project, which provides supplemental nutrition with a nutrient-rich porridge they drink two days a week. Duff said they could see older students standing at the doors and windows looking for leftover porridge. The project guarantees porridge only to the preschoolers and not the older students. “All of these kids are sitting there waiting because they know this is the only food they are going to get that day most likely,” Duff said. Kesterson-Yates said the cup of porridge was half as big as some of the preschoolers. “[The porridge] is full of nutrition and the nutrients they need to grow in case they aren’t getting everything they need at home,” Kesterson-Yates said. Students also participated in Azizi Life, a cultural experience day for rural communities to present experiences in the day-to-day life of Rwandan women. 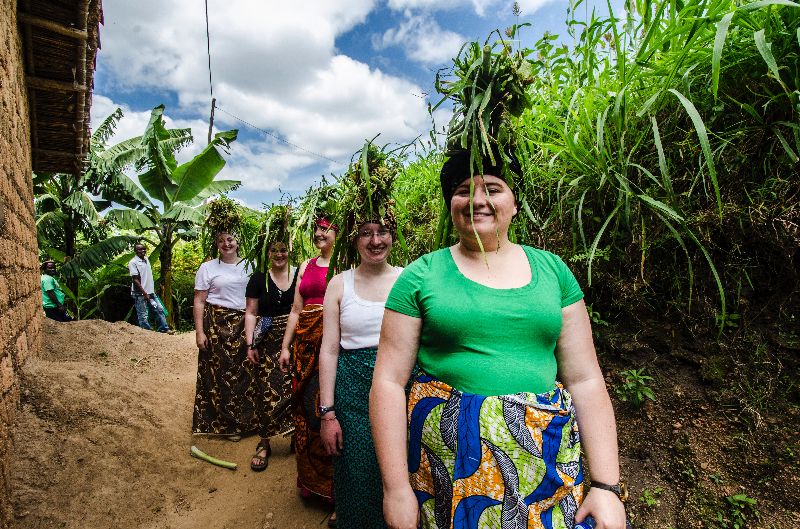 They were welcomed into a home by about seven women who wrapped traditional Rwandan skirts around the Webster students and gave them headscarves to keep their hair up while they worked. The local pastor and his wife even welcomed the group into his home and provided lunch for them without expectation to pay for the feast of traditional food they just ate. Duff said going to Rwanda allowed her to appreciate the people on a more human level. “Learning from the actual people whose culture it is, we can only get so much of an understanding and you don’t understand what a culture is before going there and actually learning from those people.” Duff said.